Q & A: The Causes Behind Hunger in America More than 13 million families in 2004 were unable at times to buy the food they needed. Finances are so strained with 5 million families that one or more members goes hungry as a result. Economic geographer Amy Glasmeier talks about the phenomenon of hunger in America. A look at what leads to hunger in rural, suburban and urban America. Counties with the highest percentage of people living in poverty are marked in dark green, with rates as high as 57.9 percent. Counties with the lowest rates of poverty -- with some registering no poverty -- are marked in light green. 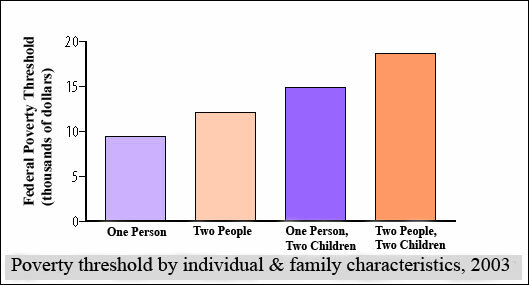 Poverty threshold by individual and family characteristics, 2003, set by the U.S. Department of Health and Human Services. 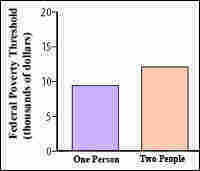 A comparison of the number of Americans living in poverty, and the percentage living in poverty, in 1959 and 2003. More than 13 million families in 2004 were unable at times to buy the food they needed, according to the U.S. Department of Agriculture. Finances are so strained for 5 million of those families that one or more members goes hungry as a result. States with the highest percentage of children living in poverty are marked in dark green, some as many as 32 percent of children impoverished. 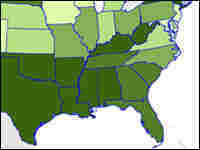 States with the lowest rates of child poverty -- 7 to 11 percent -- are marked in light green. In An Atlas of Poverty in America, Penn State University economic geographer Amy Glasmeier takes a historical and contemporary look at the problems faced by the country's poor. Here, she discusses the phenomenon of hunger in America. Q: The USDA has classified 38 million Americans as "food insecure." What is the difference between poverty and food insecurity? A: There are 37.5 million people in America who live below the poverty line, which is based on an amount of money thought to be required to provide a very minimum lifestyle. In 2005, $19,350 is the poverty threshold for a family of four, according to the Department of Health and Human Services. At the same time, the government also classifies 38 million people as "food insecure," which means at some point in the previous year they had difficulty finding the money to buy food. We can assume that many of those who aren't able to always buy the food they need are also living in poverty, but there is scant empirical research linking poverty and food insecurity. The statistics for each currently are collected separately. Q: Why is there hunger in America? A: A big part of food insecurity relates to the uncertainties of daily life. People go hungry because of unexpected events, such as paying for an emergency visit to the hospital, a car repair, or the loss of a job. So you can be just above the poverty line, and any one of those circumstances can push you into poverty. When a family is living that close to the edge, the bottom line is that cuts will be made in the consumption of food. Food is purchased with cash. If you don't have a credit card, then you have to pay cash for food. The majority of people don't have a monthly charge account at the local grocery store. There also are problems of access and distribution. Good, healthy, fresh food is expensive, especially if you work at a minimum wage job. Remember, the national minimum wage is still $5.15 per hour; that's $10,300 a year for a fulltime job. There is a definite geography of poverty. The highest rates of poverty are found in Appalachia, the Mississippi Delta, the U.S.-Mexico border and Indian reservations. I have been in poor communities where you are 30 or 40 miles from a store that manages its vegetables so they don't rot in bins. A year ago , I was in a Tunica, Miss., Piggly Wiggly food market examining the role of gambling in the economic growth of the region, and what I found there was a lot of normal products, except for the vegetables and the meat counter. The vegetables were wilted lettuce and dried apples, or even tomatoes with black spots. At the meat counter, I found mostly chicken wings and ham hocks, packaged in every conceivable way to produce a ham hock, and they're 90 percent fat. That's the sum of what's available for people to buy. Low-income communities support retail operations that sell low-cost goods. When it comes to food, low-cost items do tend to be high in fat and low in nutritional content. Q: How common is it for families to have to make a trade off between food and expenses such as health care? A: Families are often forced to make the tradeoff between food and other expenses. Health care is a particular problem. In poor, rural communities families often have no choice but to use the emergency room for routine health care. This is very expensive. Car repairs are another significant and unexpected expense. If the family car needs repair and it is the end of the month, when cash reserves are low, a family will have no choice but to reduce food intake to get the car back on the road in order to go to work. It's all about how close to the line you are. When the original poverty measure was created, it was based primarily on the minimum food budget needed for a family of three. The threshold has been increased to reflect changes in the cost of living, but the same formula is used to calculate today's poverty line. What was missing when it was created, and is still missing, is an account of all the other costs of living that income is spent on, including clothing, furniture, transportation and health care. Q: How successful has the food stamp program been at reducing food insecurity? A: According to the USDA, in 2004 the average monthly food stamp benefit was about $86 per person and about $200 per household. This average of $200 is just over one-third of what the USDA recommends a family of four should expect to spend on food using its Thrifty Food Plan. Does the program stop hunger? It reduces hunger, but it probably does not eliminate hunger if the family lives at or below the poverty line. Also, according to the USDA, the number of families who received food stamps declined dramatically between 1995 and 2000. This was a time when the poverty rate increased. Thus, just when people needed assistance most, the program was scaled back. After passage of the Welfare Reform Act in the early 1990s, the government cut back on who was eligible for food stamps and made it harder to qualify for the program. In many places in the country, fewer than half of the people who are eligible for food stamps actually receive them. According to the Food Research Action Center, many people aren't aware they're eligible for food stamps. Also, people go in and out of eligibility. If you lose a job and then get re-employed repeatedly, it is a huge hassle to get them. Stigma no doubt also matters. 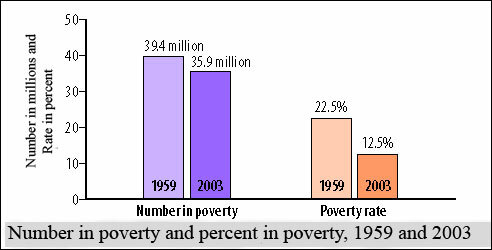 Q: How have poverty and hunger changed since the antipoverty programs of the 1960s were launched? Since the 1960s, when we started to count poverty, we have seen the biggest improvement in economic security among the elderly. Their poverty rate went from 22 percent to less than 10 percent today. Their decline in poverty was due to the creation of Social Security, subsidized health care and the fact that the government made sure that Social Security payments reflect improvements in the country's standard of living. I would suspect on an absolute basis that more children are hungry today compared with 30 years ago. A good indicator of child hunger is the number of children receiving reduced rate lunches. In recent years, we're seeing an increase in food insecurity. 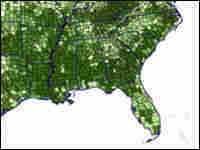 The USDA's Economic Research Service shows a rise from 11.2 percent of households in 2003 to 11.9 percent in 2004. Q: Looking forward, what part of the population would you say is most vulnerable to food insecurity or poverty? A: We're going to see a rise in economic insecurity among the elderly, partially because Medicaid and Medicare only cover certain issues and certain drugs, and — most profoundly — because there is a decline in employer-based pension benefits, due to corporate bankruptcies, and also benefit take-backs. A telling example: GM's most recent negotiation with UAW resulted in larger co-payments for the elderly and larger personal contributions to their drug purchases. Q: How does food insecurity differ among rural, urban and suburban settings? First we have to take account of differences in expenses — primarily housing costs. For instance, the cost of housing is higher in urban versus rural areas. Other expenses to take into consideration are transportation costs. These hit rural families particularly hard. Rural residents have few choices aside from owning a car. Health care, furniture, clothing — these are all costs everyone incurs, although there might be a modest difference based on access. Thus, the cost of these expenses may cut both ways. In rural areas, there is some possibility of contributing to one's livelihood through subsistence types of activities such as hunting and growing one's own food. That is a major means by which rural families get by in certain parts of the country. Deer hunting is a major activity in a place like rural Pennsylvania, where I come from, for example. Q: On average, is food insecurity chronic? Does hunger tend to be permanent or temporary? A: Food insecurity is primarily temporary. It often relates to some unexpected event that consumes the only cash a family has. If you haven't got much money, you certainly don't have the ability to shop when there are sales. You basically are living hand to mouth. Q: Food insecurity exists at a significant level in the United States, according to the government. Ultimately, what would you say is responsible for this situation? A: At the core, hunger is the result of employment instability and the lack of an adequate minimum wage. If an employer is allowed to pay a person a wage that essentially does not lift them out of poverty, then the real culprit is failed federal policy. The argument against raising the minimum wage is that it would put small businesses at a disadvantage. The bottom line is that the only sectors that would be seriously affected by raising the minimum wage are industries producing goods traded overseas. Given that a huge fraction of the national economy is comprised of non-traded goods and services, we could raise the minimum wage and generate little or no harm to business. In fact, if we raised the minimum wage, I think employers would be inclined to invest in people's skills because they would be more "valuable," and hence employers would want them to be more productive. Paying people a living wage is ultimately about personal dignity. People who work should be able to live above the poverty line. Amy Glasmeier is the E. Willard Miller Professor of Economic Geography and John Whisman Appalachian Scholar at Penn State University. She is also a visiting professor at the University of New Hampshire's Carsey Institute.